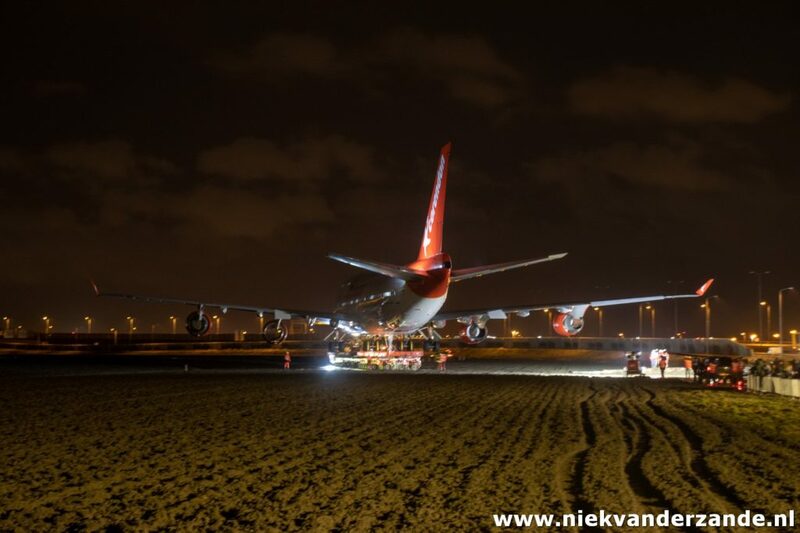 In the weekend of 9 February 2019, an extraordinary transport took place next to Amsterdam Airport Schiphol. 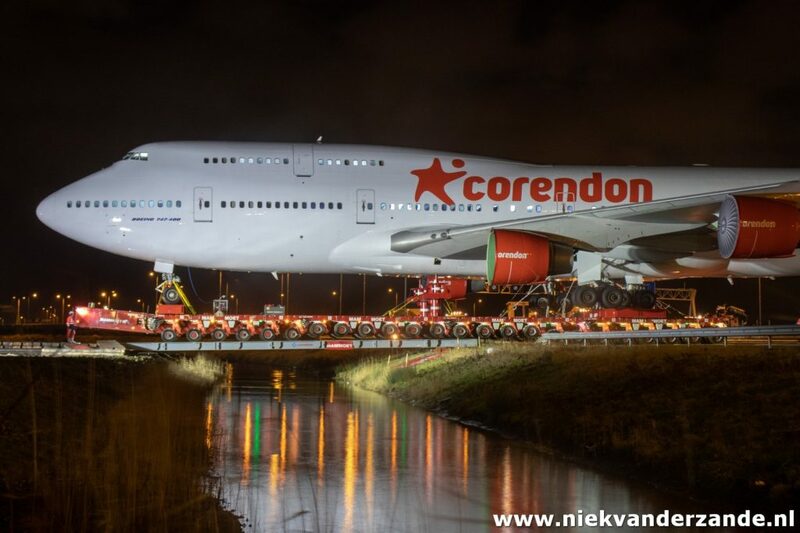 During this weekend, a Boeing 747 was transported from the airport to the nearby Corendon Hotel. This whole story started a bit like a joke. 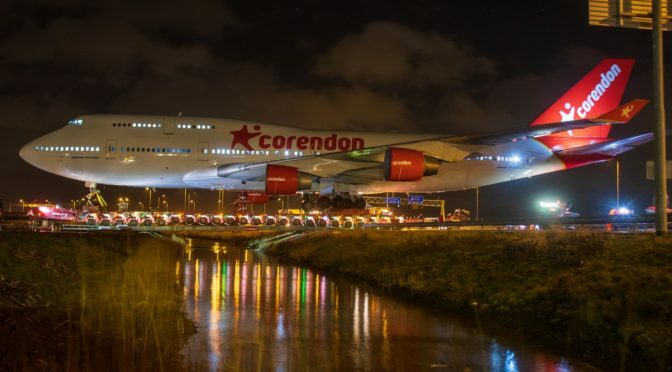 When KLM announced the gradual retirement of their Boeing 747s, Corendon founder Atilay Uslu thought that it would be a nice idea to buy one of these 747s, paint it in Corendon colours and park it next to the Corendon hotel in Badhoevedorp. 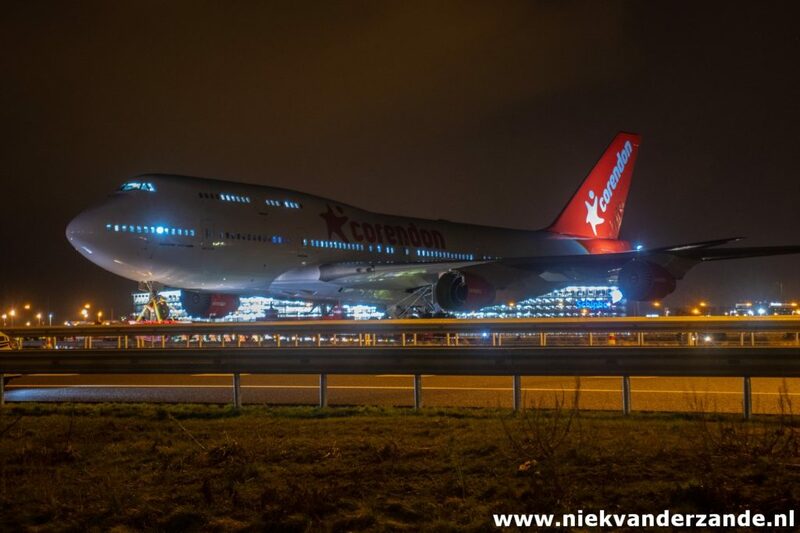 In October 2018 it was announced that Corendon would buy the Boeing 747-400 -BFB “City of Bangkok”. 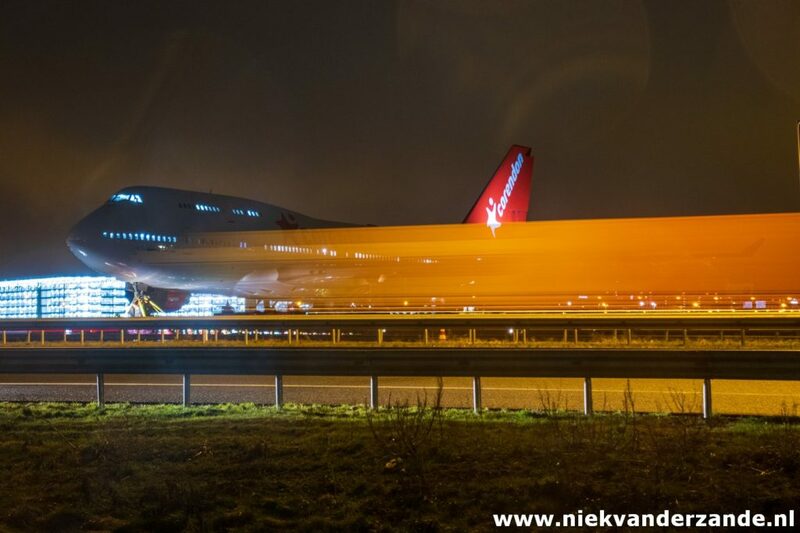 On the 26th of November, this 747 returned from her last commercial flight to Los Angeles. 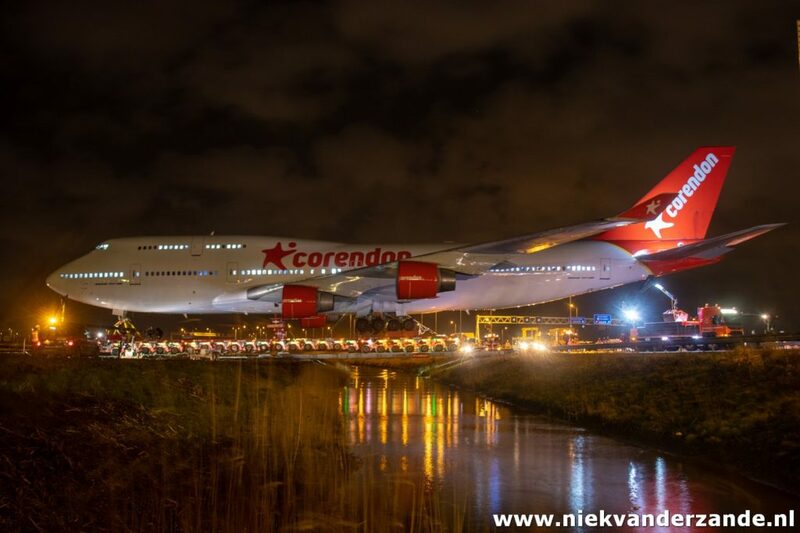 On the 10th of December, the Boeing was flown to Rome, where it was painted in the colours of Corendon Airlines, she returned to Amsterdam on the 14th of December, which was also the last flight of the PH-BFB. 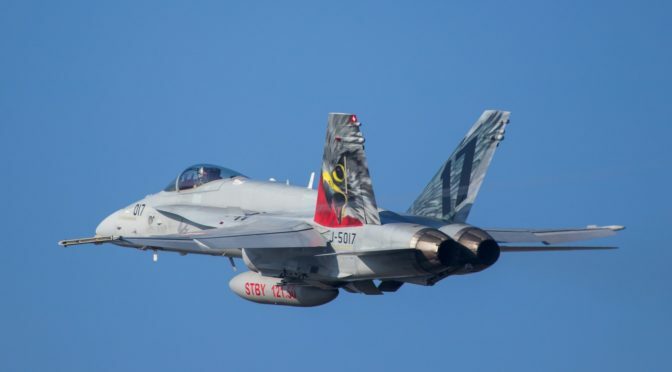 After this final landing, AELS removed the engines and other valuable items like the Auxiliary Power Unit (APU), brakes, fuel pumps and air conditioning. On the 5th of February 2019 the whole move, that would take a week and which was executed by Mammoet, started. 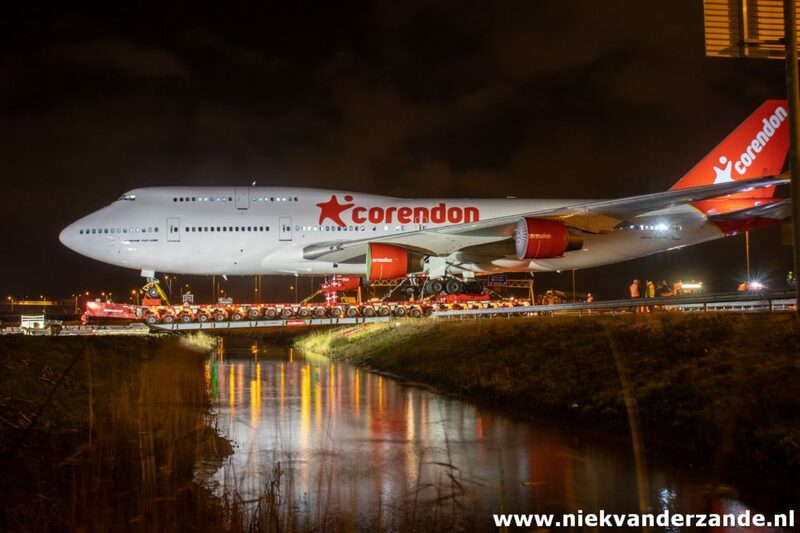 In order to move the Boeing, it was loaded onto a massive, remote controlled, flatbed trailer. The trailerhas 192 individually controllable wheels, that evenly distributed the 160 tons weight of the 747 and the 200 tons weight of the trailer. 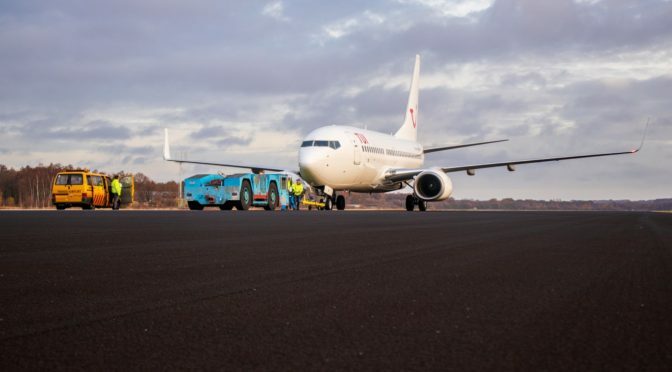 The first leg of the move was still at Schiphol Airport, where it covered an 8 kilometer stretch from Schiphol-East towards the Zwanenburg runway. At this point the City of Bangkok left the airport and continued her journey across the meadows towards the hotel. In order to avoid sinking into the soggy ground, 21000 steel road plates were laid out in order to create an artificial road for the transport. Next to that, 17 ditches had to be crossed, for which temporary bridges were constructed. 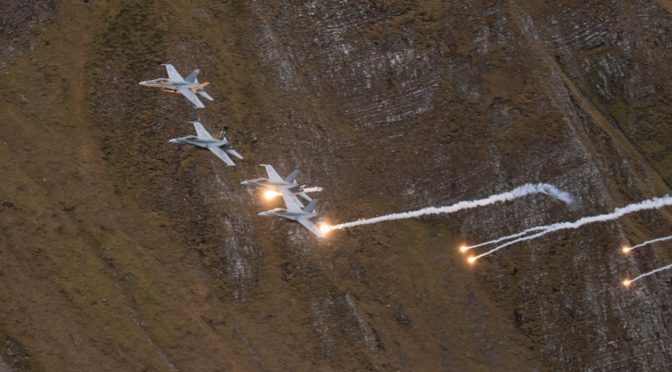 The most impressive part of the whole operation took place in the night of 9 February, when the whole transport had to cross the A9 Motorway. In order to do this, the whole A9 was closed for several hours. At that point, first a couple of lamp posts had to be removed, as well as the guardrail in the central reservation. Then, the transport could slowly creep up to the motorway. Before it entered the tarmac of the motorway however, all 192 wheels of the trailer had to be cleaned, as the authorities did not want to have any mud on the road. Once the motorway and the adjacent ditch were crossed, the 747 transport could continue through the meadows towards the hotel. Finally, on the 11th of February, the last stretch was covered. 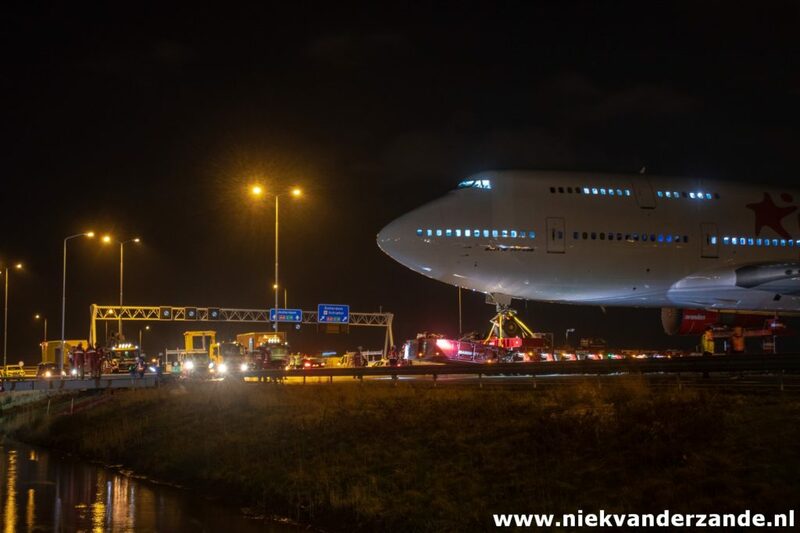 At the hotel, the Boeing 747 had to make 57 turns, in order to rotate it 90 degrees and park it at the final position. 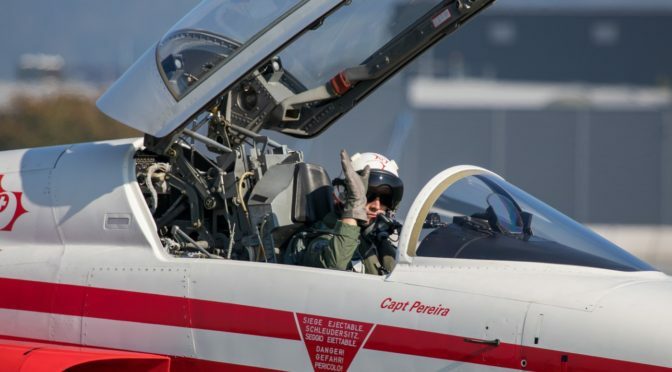 Over there an aviobridge will connect the hotel with the Boeing, which wil serve as an experience center, where visitors can walk on the wings and can experience a 5D flight inside. It will also serve as a visitors centre, where the history of the “City of Bangkok” will be told.